A heel spur (calcaneal spur) is a bony growth on the heel bone, it can occur along the sole of the foot towards the toe (plantar heel spurs) or along the Achilles tendon at the back of the shoe cap (dorsal heel spurs). In the UK, about one in ten people are affected with this condition at some point during their lives and it usually affects middle aged people between 40-65, although it can happen to those much younger also. It usually occurs when there are minor injuries at the junction between the tendon and bone at the heel. As the body promotes tissue reconstruction to repair the damaged area, eventually calcification can occur which leads to bony growths called heel spurs. The condition is also closely related to the development of plantar fasciitis (inflammation of the plantar fascia) which is the tough fibrous tissue at the sole of the feet, which stretches from the heel to the toes. Heel spurs can make walking or standing for a long duration uncomfortable although they are usually not painful. strong, stabbing pain in the heel or sole of the foot. This pain may increase when the patient walks or jumps. When the individual sits, lies down, or rests the leg, the pain disappear usually subsides. The pain can also be triggered by pressing on the appropriate place on the heel. A plantar calcaneal spur hurts the inner front edge of the heel sole, whereas the dorsal spur usually affects the pressure point at the toe cap or slightly higher near the intersection of the Achilles tendon. 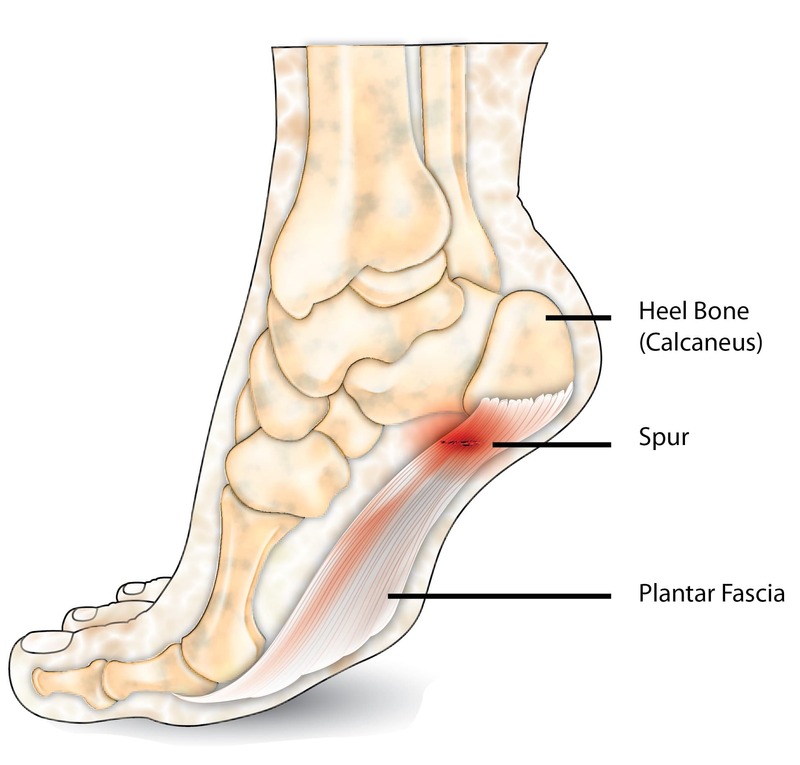 The emergence of heel spurs is often related to an increase in calcium deposits building up at the heel when there is an overload of action using the plantar fascia in which it pulls away from the heel leading to minor injuries and cracks in the region. As the body reacts to the injury by aiming to repair the tissues by rebuilding it, small calcifications occur and finally a heel spur. Obesity – here the heel is more heavily loaded with every step putting more strain on the heel and plantar fascia. Insufficient warm-up exercises before sport – calf muscles, tendons and ligaments are then stretched further and exert a greater force on the tendon insertion at the heel. Age – as an individual becomes older, tendons and bones are less padded and are thereby more highly stressed. If there is already a heel spur, it is amplified by each additional load. Most individuals that experience typical heel spur pain can point straight to the diagnosis. This suspicion is usually reinforced when pressing on the front edge of the heel sole, in the toe cap or at the base of the Achilles tendon which triggers or intensifies the pain. The painful area is usually neither swollen nor flushed. In order to medically confirm the diagnosis though, an X-ray is usually performed on the foot laterally. It is normally clear to see ossification according to the shape of the heel and direction. The key to treating heel spurs is to find the root cause of the problem, whether it is due to the flat feet or overstretching of the plantar fasciitis. For most people it will not affect their day to day life, but in others where the pain is severe, medical treatment is needed from a doctor, who may prescribe orthopaedic insoles and physiotherapy, which relieve the affected heel. A heel spur would often regress by itself. This per se is not a problem because the symptoms are caused by the inflammatory response and not by the bone spur. The inflammation can be reduced with physiotherapy or targeted medication, so that the symptoms disappear. An operation on the heel spur is very rarely necessary. SportNova UK © 2019 All Rights Reserved.